CFI's Twitter page, which is indicative of our vibrant and engaged community, has reached a new milestone. This page is considered a hub of information and shares comments from hundreds of stakeholders taking part in projects in Africa, the Arab world and South-East Asia. As such, it provides readers with updates on initiatives in the field that are organised every day and therefore keeps them informed about the key stages of each project. 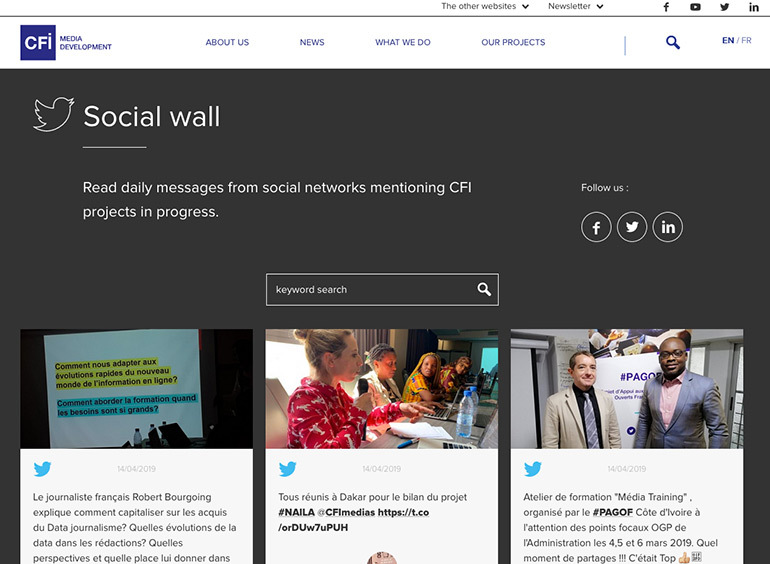 In other news, the “Social wall" feature that was created this year can be accessed from the cfi.fr/en homepage. Every message posted on social media that relates to a project is collected and appears here, thereby making it easier to read all the messages in one place. The Social wall also appears under each project featured on the “Our projects" page to immerse readers even more in the details of each project. CFI makes good on its intention to share information openly by providing its 10,000 followers on Twitter and almost 30,000 Facebook fans, with daily updates on its media development projects.